A Purchase Order (PO) is an official commercial document issued by a buyer to a seller, listing requested items and their prices. Organizations often use POs to allocate funds for payment after requested goods are received. They are used by organizations to control the purchasing of products and services from external suppliers. Generate a PO using your normal internal purchasing system (speak with the purchasing or accounts payable department if you are unsure how to do this). Log in to your Addgene account and select the plasmids you require. If you require a quote, you can print one at the bottom of your Cart. When you have added all the items you require, click ‘Checkout’ in your Cart and complete the required information. The PO number can be used for payment in Step 3. When your order ships we will invoice your institute for payment, quoting the PO number provided. Please be sure to provide your Accounts Payable address as the Billing Address at checkout to avoid payment delays. There is no need to email us a copy of your PO. So long as a valid PO number is referenced when you order online, your order will be properly invoiced. Many institutions require a quote in order to generate a PO. All quotes from Addgene are created by the customer on our website. 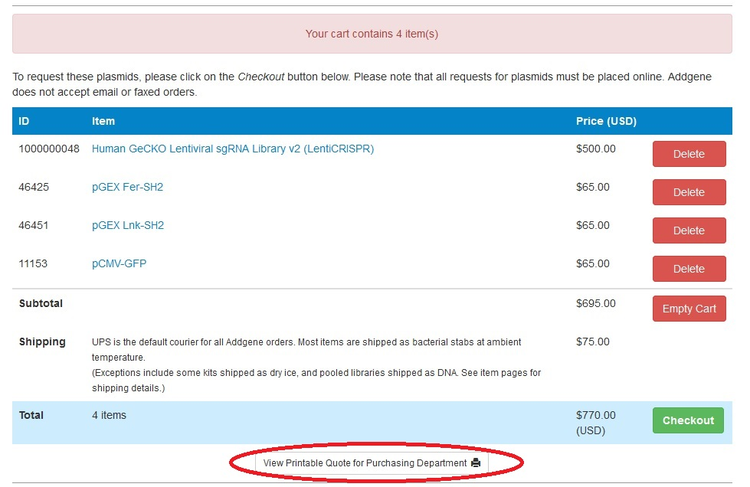 Just log in to your Addgene account (or create one), add the plasmids you would like to order to your Cart, and select the View Printable Quote for Purchasing Department option from within your shopping cart (Grey link below checkout button). Purchasing Agents are able to place orders on behalf of scientists. They will need to list the scientist and PI requesting the materials, but can include the purchasing department’s email address in the Contact section of the order. This will ensure that the MTA document is generated correctly, while allowing the Purchasing agent to be copied into all order emails. When the order ships, they will receive a Shipping Notification with the tracking number for the materials. To avoid duplicate orders, we ask that scientists coordinate with purchasing agents to determine who is to place the order online. During checkout, customers may enter a PO number or a credit card as a form of payment. If the customer chooses to “Pay by PO”, they provide their PO number and billing address at checkout. After the order ships, Addgene will send an invoice referencing that PO number to the billing address provided (typically, this should be the Accounts Payable department address). 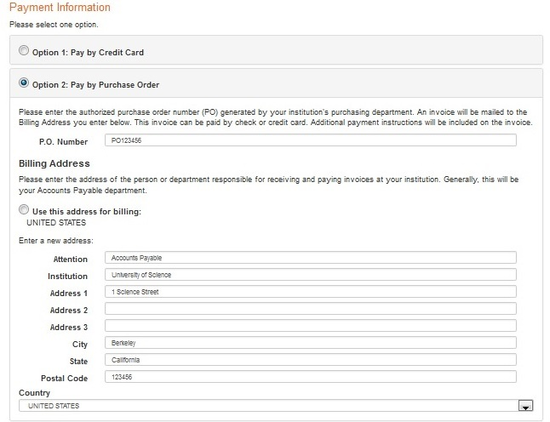 Your institute will then verify the information on the invoice and remit payment to Addgene by check, bank transfer, or credit card. Please note that the PO number alone does not transmit any funds. To avoid payment delays, please make sure the PO number provided is valid for the total cost of the order, and that the billing address is correct. Please note that for most institutions, each PO number may only be used for one order (with the exception of “blanket” POs). Reusing PO numbers will result in payment issues. The Purchase Order (PO) Number entered must be authorized by your organization’s purchasing department with funds available to facilitate payment of your order. An invoice referencing the PO Number will be generated after the order has shipped and mailed to the Billing Address entered during checkout for payment. Payment terms are Net 30 days from the Invoice Date. Note that Addgene does not require a hard copy of your organization’s purchase order. Non-U.S. customers, please note: If your organization does not generate purchase orders, enter your full name in the purchase order number field during checkout to certify that your organization has approved this order and that funds are available to pay for your order upon receipt of an invoice. If you can't find the answer to your question on this page, please check our Help Center.